KATHMANDU, Nov 27: Lawmakers have demanded to halt the construction process of the Kathmandu-tarai fast track, citing protests by locals in Khokana and Pharsidole areas of Lalitpur district. Speaking at the meeting of the State Affairs Committee (SAC) of parliament on Monday, the lawmakers accused Nepal Army of expediting the construction of the fast track keeping the locals under threat. Most of the SAC members demanded that the committee write to the army to halt the construction process. Earlier, SAC members visited the starting point of the 76 kilometers long fast-track where locals have been staging protests to press the government for changing the route of the national pride project. The committee had invited the chairpersons of two wards in the Khokana area to the committee on Monday to put forth their grievances. 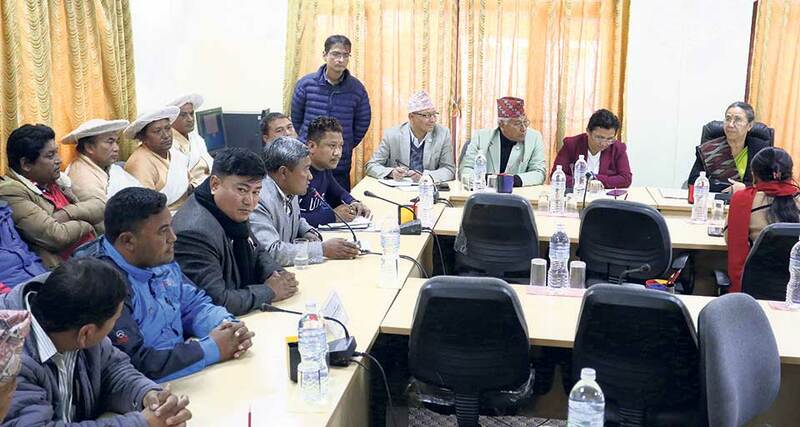 The ward chairpersons said that the proposed starting point of the fast-track threatened the historical identity of the Khokana area and demanded to change the route of the road. “Nepal Army has started the construction process without preparing the detailed project report (DPR). Using the army to terrorize the people is not fair. The committee should write to the government to stop the construction process for now. Using the army to forcibly expedite the construction of the fast track has to stop,” said ruling Nepal Communist Party (NCP) lawmaker Krishna Gopal Shrestha. Similarly, main opposition Nepali Congress (NC) lawmaker Dilendra Prasad Badu, too, demanded to halt the construction process and resume the work only after preparing the DPR. “The construction of the fast track has been accelerated without preparing the DPR and the army has been forcing the locals to receive compensation against their will, terrorizing them with guns,” said Badu. Former minister Pampha Bhusal, a lawmaker from Lalitpur district, said the fast track should be started from a place between Bungmati and Khokana. “The army has pressurized the locals to receive Rs 180,000 as compensation, irking the locals. Any development project should consider preserving historical and cultural sites,” said Bhusal. Another NCP lawmaker Brijesh Kumar Gupta opined that the committee summon Prime Minister KP Oli and ask him to explain why the construction of the fast track was begun without preparing the DPR. SAC Cchairperson Shashi Shrestha said that the committee will take a decision on the matter only after consultations with Defense Minister Ishwar Pokhrel. “I will talk to the defense minister about this issue personally. We will reach an appropriate decision very soon,” said Shrestha.